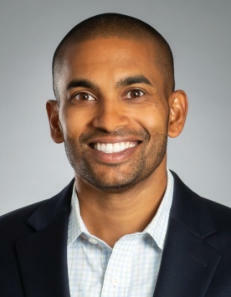 Dax Varkey, MD, joined Murphy Wainer Orthopedic Specialists as an orthopedic surgeon in September 2018. A graduate of the University of North Carolina at Chapel Hill School of Medicine, Dr. Varkey completed an orthopedic surgery residency at UNC, followed by a Sports Medicine, Shoulder and Elbow Surgery Fellowship at OrthoCarolina in Charlotte. His specialties include surgical treatment of shoulder, elbow, knee and hip conditions and injuries. In addition to performing general orthopedic procedures, Dr. Varkey’s rigorous fellowship training allows him to perform more complex surgeries – such as revisions of shoulder replacements, rotator cuff repairs and ACL reconstructions, as well as cartilage restoration and hip arthroscopy. Because of this advanced training, Dr. Varkey is able to offer a local option to patients who may have previously been referred out of town for specialized care. “I’m looking forward to helping people with sports-related injuries and shoulder and elbow-related injuries who otherwise might have traveled long distances to get their care,” he says. HELPING OTHERS GET BACK TO LIFE Dr. Dax Varkey enjoys providing orthopedic care that helps people achieve their goals, whether they are athletes who have been sidelined from a game they love or adults who are seeking better mobility to perform everyday tasks. “Everyone has a goal,” Dr. Varkey says. “For some, it is returning to high-level athletics. For others, it is trying to stay independent and active with minimal pain. I want to be able to help patients achieve their goals and get back to doing things they enjoy.” Dr. Varkey has served as an assistant team physician and performed surgery for the Carolina Panthers. He also has provided orthopedic care for high school and college teams, including the UNC Tarheels, Davidson Wildcats and UNC Charlotte 49ers basketball and football teams. EDUCATION o Undergraduate: University of North Carolina at Chapel Hill o Postgraduate: University of North Carolina at Chapel Hill School of Medicine (MD); University of North Carolina at Chapel Hill School of Public Health (MPH) o Internship and Residency: Orthopedic Surgery, University of North Carolina o Fellowship: Sports Medicine, Shoulder and Elbow Surgery, OrthoCarolina, Charlotte, NC o Awards: Morehead Scholarship to attend UNC Chapel Hill; Resident of the Year; Resident Teacher of the Year FROM THE FAMILY FARM TO MEDICINE Originally from Pittsboro, Dr. Varkey grew up performing chores on the family farm, where he learned the value of hard work. He attended UNC on a Morehead Scholarship, which provides top high school students with full tuition and expenses for four years, completing an undergraduate degree in biology. He went on to earn not just a medical degree, but also a master’s in public health – which he says was valuable because it offered information beyond what is taught in medical school about providing quality care to patients. While in training, he was named Resident of the Year and Resident Teacher of the Year in musculoskeletal medicine. Dr. Varkey is the co-author of a book chapter on ACL reconstruction as well as research papers on rotator cuff tears and patellar instability. FAMILY AND INTERESTS Dr. Varkey and his wife, a registered nurse, have a 2-year-old son. In his spare time, Dr. Varkey enjoys traveling, playing golf, fishing, cooking with his wife, and exploring Greensboro’s many parks with his wife and son.